It may sound strange, but cover letters should keep the same design as you resume. This means that the heading with your name and contact information along with the font should be consistent across both documents. By doing so, you present a polished package of professionalism that hiring managers quickly pick up on. For additional help, check out our other articles on resume design and resume format examples today! Make sure include a proper business heading on your letter starting with the date and followed by the individual’s name, individual’s title, company name, and company address. This will ensure that your letter is forwarded to the person responsible for hiring. 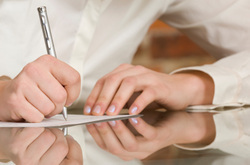 Then start the letter with a formal business greeting such as, “Dear Mr. (Individual’s Name):” or “Dear Sir or Madam:”. Don’t forget to use a colon instead of a comma! In order to clearly outline your qualifications for the job, choose 3-5 recent accomplishments that you feel would make a good impression on the reader for the particular position that you are applying for. After a short statement leading into your particular qualifications, use bullets to briefly summarize your accomplishments. By breaking up the letter and using bullets, you will be drawing the reader in and highlighting key skills. In the end, if you have room, you can state some related professional skills that would help you stand apart from others. These can be anything from a strong work ethic or organizational skills to experience training management and communicating with top executives. This would also be the place to discuss any salary requirements or relocation preferences. At the end, ask for the reader to contact you for an interview and thank them for their consideration. When you are happy with your resume cover letter content, end it with a professional “Sincerely,” followed by your hand written signature (if you are not emailing the document), and your printed name. If you are enclosing your resume with the letter (and we highly recommend that you do!) include a note beneath your printed name such as “Enclosed” or “Enclosed: Resume” depending on your preferences. Read here for more information on how to create a professional resume!